Two of my most visited posts are the recipes for Braciole (Meat rolled around a stuffing) and Polpettone (large meat roll made with mince meat and with a stuffing). There are many similar recipes of meat rolled around a stuffing, for example the Sicilian farsumagru (falsomagro, in Italian), involtini – or you may know them as saltimbocca or salti in bocca. Smaller in size are are ucelletti or ucellini (both words mean little birds in Italian) and olivette (little olives). I found a recipe called Alivuzzi Di Carni (Sicilian for Olivette di Carne – meat olives) in my copy of Cucina Nostra by Maria Consoli Sardo, published in 1978, 1 edition. Translating recipes from the Italian always requires a poetic licence – ingredients, times, quantities are often missing, but the following cooking method and amounts of ingredients works for me. Trim and pound the steaks to about 5mm thick, each 5-6cm in size. Spread some of the stuffing over each steak. Roll the steak around the filling and secure with netting (I use a toothpick or string). Sprinkle each olivetta (singular for small olive) with salt and finely ground pepper. Place the olive oil in a large frypan and sauté the celery, parsley, onion until softened (over medium-high heat). Add the rolls and lightly fry them until lightly browned on all sides. Add wine to hot pan and evaporate for a few minutes. Add water and cook gently with a lid until cooked. 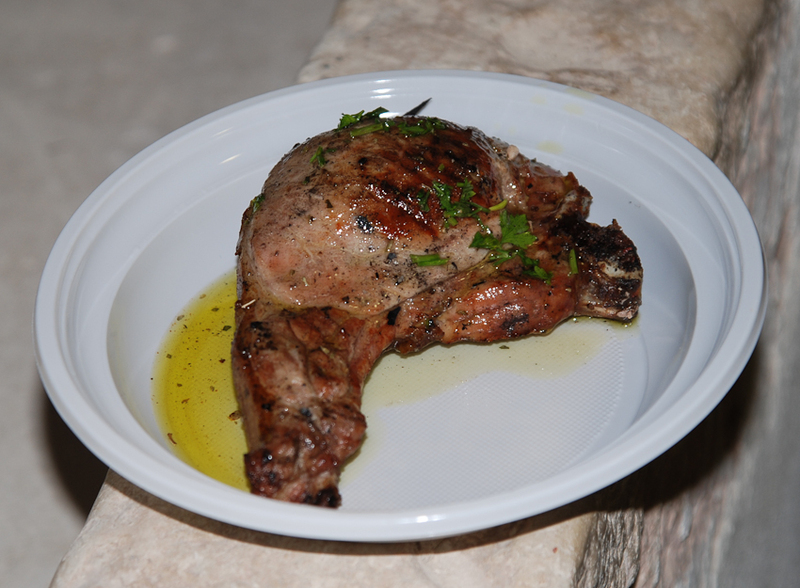 The Sicilians from the southeastern corner of Sicily, especially from Ragusa, eat a lot of pork. One of their signature dishes is ravioli di ricotta al sugo di maiale. These are ravioli stuffed with slightly sweetened ricotta and dressed in a strongly flavoured, slow cooked, tomato ragù (ragout) made with pork meat, which includes some pork skins. Another dish my relatives in Ragusa make are causuneddi, which is a Sicilian word with no Italian or English translation. Causuneddi are gnocchi-shaped pasta cooked with what Sicilians call broccoli which are, in fact, young kohlrabi complete with leaves. Strips of pork skin are added for flavour. My aunt Niluzza is a champion at making both of these. Pork sausages are added to sugo (a meat tomato sauce used to dress pasta), eaten fried or grilled. 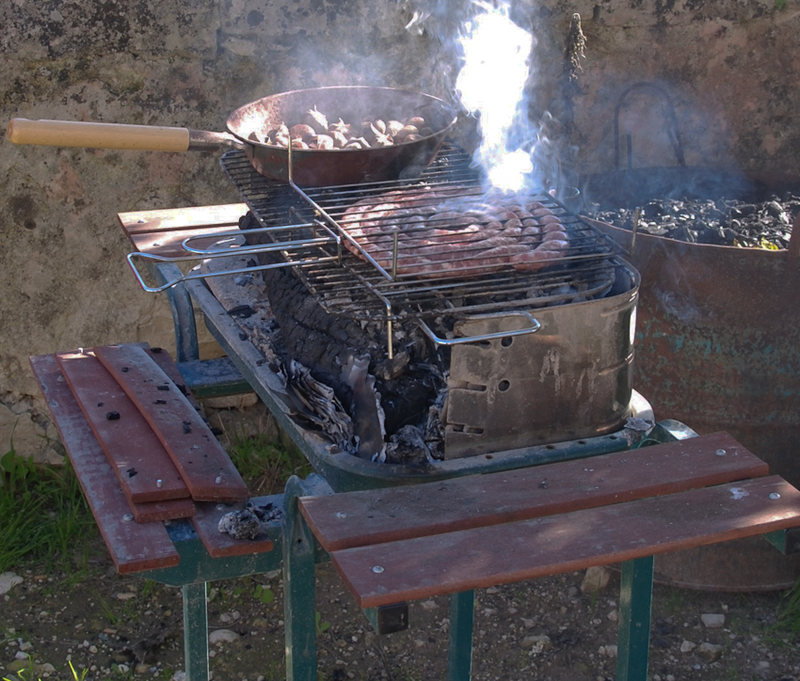 I have included a photo taken when I was last in Ragusa of a length of coiled pork sausage being cooked on a rustic grill – the Sicilian version of a BBQ – in fact, an Italian BBQ. No fancy BBQs for Italians. The length of sausage has no links and it can also be cooked in a frypan. Done this way the sausage is poached in a little water, without a lid. When the water evaporates the coiled sausage begins to brown in its own fat. 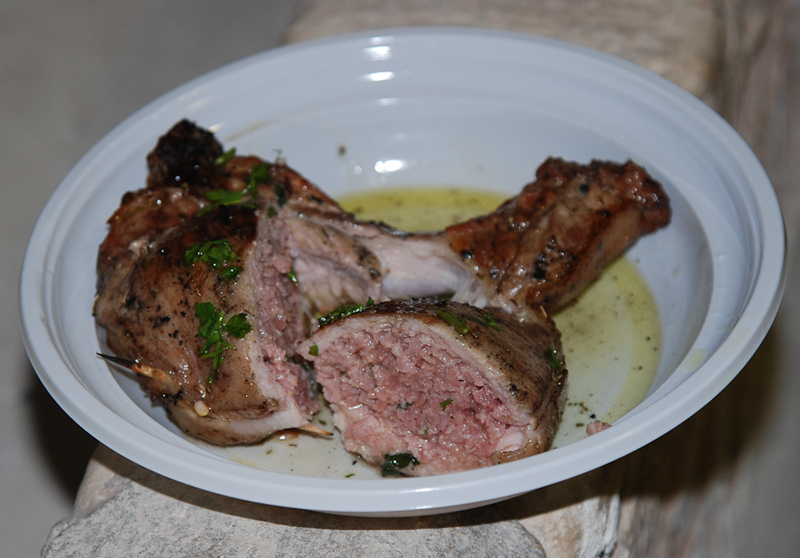 This is another version of braciole di maiale, except that these are stuffed. The braciole (see previous post) are farcite or imbottite (word for ‘stuffed’) mainly with a mixture of pork liver and pork sausages. You would have to ask your butcher to supply you with double pork chops with a slit in between them (as if you were cutting them into two chops) and then you can go home and stuff them. My younger relatives (daughters of my cousins) would not dream of making them at home, they have a favourite butcher and he made these braciole for them. It was a different story for their mothers. Mix liver, sausages (without skins) minced pork, salame, pepper, fennel seeds and a little red wine. Stuff each double chop with some of this mixture. Close the chops by sewing the edges. Softened the onion in the oil, add the chops and sprinkle with the wine and water (or broth). Braise the chops (with lid) for about 30- 40 mins over low heat until cooked. You may need to add more water/wine – do not let them dry out. I asked my butcher to mince some very lean beef for me – I was going to have it as steak tartare. I did not get around to using it and made a polpettone (a large meat ball/ loaf, called a purpittuni in Sicilian). In previous posts I have written about polpette (meatballs) and braciole (meat rolled around a stuffing), and although making a polpettone is very similar to these recipes it gives me an opportunity to get a photo – visuals are helpful when cooking a recipe. In this polpettone, I have placed some stuffing in the centre, as one would do when making a farsumagru (a large, thinly pounded steak of young beef, rolled around a stuffing) and this time I have used a few slices of cooked ham, small bits of pecorino and hard-boiled eggs. In Italy, cooked ham is called prosciutto and what we call prosciutto in Australia is known as prosciutto crudo (raw ham). 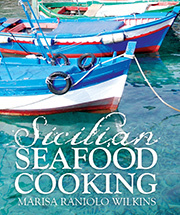 The older, Sicilian recipes rarely include wine in cooking (vinegar, yes) so the wine is optional. I need to mention the platter. It is one of Giacomo Alessi’s ceramiche (ceramics, just I case you have not guessed). 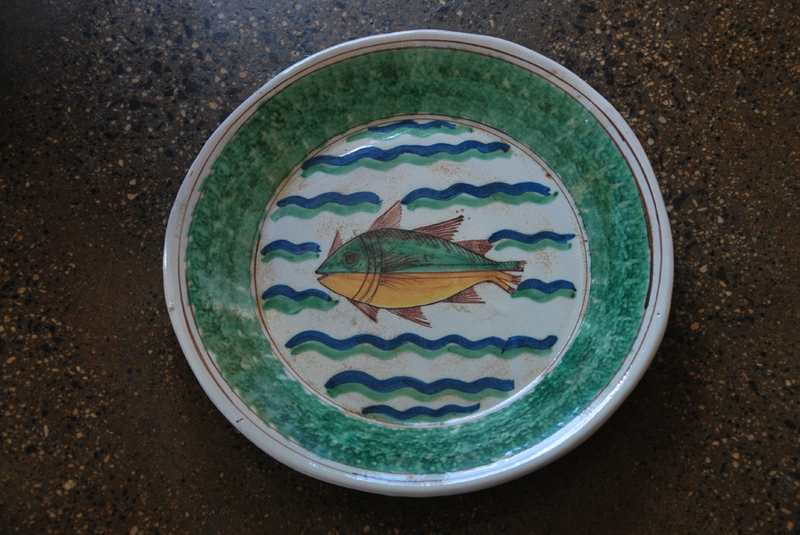 I bought my very first in Caltagirone, Sicily’s most important centre for ceramics and where Alessi’s pottery is based. He has since established other outlets; I bought the one in the photo in Erice (central Sicily) last year and I purchased another in Palermo. I love his ceramics, especially the ones with the bright green border; these are based on traditional and very old designs. I am attracted to his use of strong colours, the ornamentation and images he uses, so evocative of the past. All my cousins and their offspring have the very old, original platters scattered around their homes (not Alessi’s, but he has reproduced and revived the old designs). They had belonged to Rosa, my paternal grandmother (Ragusa), but unfortunately when they were distributed within the family I was out of sight and out of mind. Apparently, one of the many uses for these platters was to dry conserva (rich tomato paste), which was placed to dry in the hot, Sicilian sun. A braciola generally is a cutlet in Italian, but in the south of Italy (and In Sicily) a braciola is also a slice of fish or meat usually rolled around a stuffing. 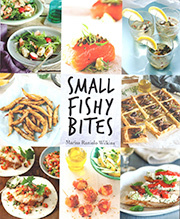 The smaller in size bracioli (Sicilian and plural) are sometimes referred to as braciulini and braciulittini. The most common cooking method is to braise them in a tomato salsa. Some of you may be more familiar with the Sicilian, large, stuffed, beef roll called farsumagru (falsomagro, in Italian meaning false lean and probably a corruption of farce maigre in French]. 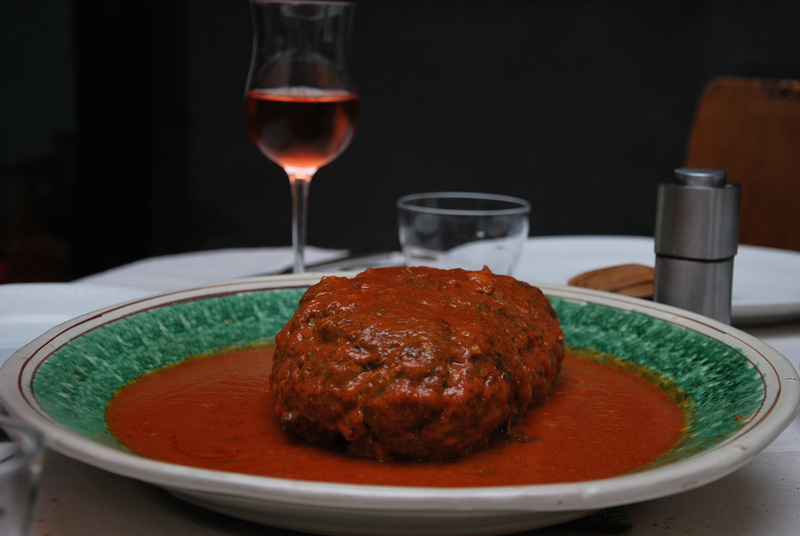 Farsumagru is really a large braciola cooked in a tomato salsa and presented sliced. In the rest of Italy slices of meat or fish rolled around a filling are more commonly known as involtini – made with veal and stuffed with cheese, ham and sage and then fried in a little butter or oil and deglazed with a little white wine. You may know them as saltimbocca or salti in bocca (literally – jump in the mouth). Sometimes involtini are called ucelletti or ucellini and both words mean little birds in Italian (as a child growing up in Trieste, it was common to eat real little birds on polenta!) . It is fascinating how words are adapted from one nation to another – in French, rolled beef with a stuffing are also known as birds: oiseax sans têtes (headless birds). The English (and hence Australians who inherited a predominately an English cuisine) called them olives, or beef olives (to differentiate them from olives from a tree). These were usually stuffed with herbs, a little onion and breadcrumbs as indeed Lynette, my Anglo-Adelaide-Australian sister-in-law remembers her mother making. The name seems to be an example of folk etymology – the process by which a word is adapted to another use because of some confusion of pronunciation and meaning. 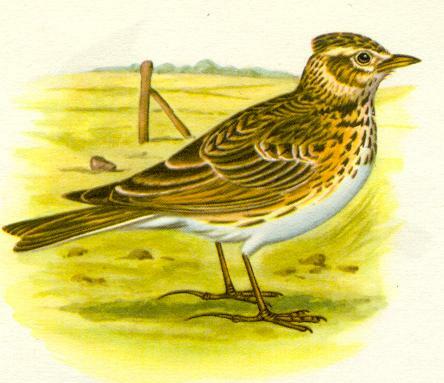 In old manuscripts the same dish is called alowes (or aloes or some other attempt at interpreting a word phonetically) – which comes from the French for small birds (alouette is a lark). After some time in England the word became heard as olives, which are also small, round, and stuffed – and there you have it. The idea also explains why they are also called ‘beef birds’ or oiseaux sans têtes (headless birds). To confuse the matter even further, small flat pieces of meat (or fish) rolled around a filling are also called paupiettes (poupiettes, polpettes etc) – derived from the Italian polpa for flesh, or turbans, which is self-explanatory. It would appear that thin slices of pounded veal or beefsteaks rolled around a stuffing are part of many cuisines. For example the Germans have rouladen, the Maltese have braġjoli, and the Argentinians prepare matambre arrollado. There are many regional variations to stuff braciole, the two most common are hard-boiled eggs, sausage mince or preserved meats and the other is a mixture of breadcrumbs mixed with herbs, grated cheese and raw eggs. In Messina (north east coast of Sicily) pine nuts and currants are often included in the bread mixture. I like to add grated lemon peel to this version. 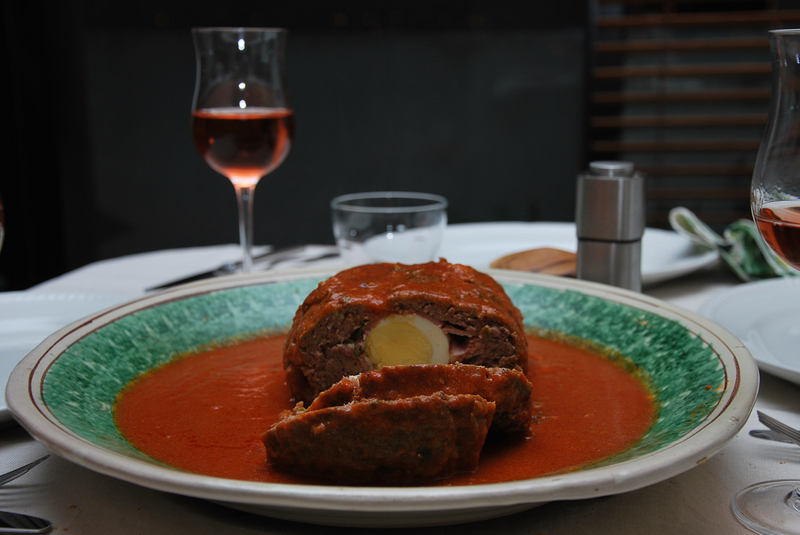 These braciole in the photos have a fairly common stuffing of ham, cheese and hard-boiled egg and they and braised in a simple tomato sauce. The photos were taken in Lynette’s kitchen; we used the tomato sauce to dress the pasta and presented the braciole as a main course (with salad). The parcels may not appear to be wrapped as beautifully as they could have been; we had eleven for lunch on Sunday and after stuffing artichokes we prepared the eleven braciole in a big hurry. Each should look like a mini torpedo with one row of string along the longest part first and the trussed laterally. But this did not matter, they tasted good and the filling was secure. Cut the string and remove it before you bring it to the table; surprisingly they do not fall apart. Veal or beef (topside, flank) trimmed and pounded thinly – 1 per person. 1 slice of either: prosciutto cotto (cooked ham), mortadella, or thin salame. 1-2 cheese slices: (caciocavallo would be used in some parts of Sicily), pecorino or provola. Extra virgin olive oil, dry red wine, tomato passata, oregano or basil, salt and black pepper. Pound the steaks to about 5mm thick. Place one slice of prosciutto cotto over each steak, follow with cheese and lastly with the egg. Roll up to enclose the filling and secure with string (some use toothpicks). Place the olive oil in a large frypan and over medium-high heat sauté the rolls for 3-4 minutes, turning them, until lightly browned on all sides. Remove them from the pan. Add the passata, bring to the boil and add braciole. Reduce heat and cook gently for about 30-40 minutes.